Snare trap wire is commonly used by hunters, fishers, and outdoor enthusiasts. Whether planning a simple day hike or taking the ultimate outdoors trip, snare wire is one of the top elements to a survival kit. Ask any experienced hunter and discover that snares are one of the simplest yet most effective traps. Snares are commonly set along game trails and near watering holes to trap unsuspecting prey. Most often, this tactic is used for small game. Small game includes animals such as squirrels, rabbit, and ground-dwelling fowl. Snare trap wire is designed to be effective in virtually any climate and environment. However, be sure to check local and state laws to learn of all trapping regulations. Snare wire has many beneficial uses in addition to hunting and trapping. For example, DIY tripwire alarms can be used as an alert to bear and other unwanted guests. Malin wire can also be used to build and support shelter as well as secure gear. Snare wire is considered the duct tape of all wire with unparalleled versatility and flexibility. With infinite uses, snare trap wire is the ultimate survivalist’s tool. Because of countless uses, snare wire is sold in bulk packaging that includes a 100-count box of coils. As a result, you never have to be without this necessity. Coils can easily be added to a day-hike pack, the ATV storage, or kept at the campsite. Malin Co. has been around since 1884. That gave us enough time to get our products down pat. In addition to traditional snare wire, Malin crafted full lines of varying alloys and materials. 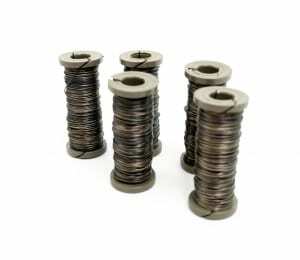 Including galvanized wire, ultra-fine wire, phosphate coated wire, safety lockwire, and much more. An array of packaging styles include straightened and cut wire. Additionally, sizing variations include spools, canisters, and bobbins. Depend on Malin to have quality wiring solutions for every situation, every time.